Spoilers: Super Mario Maker is so much fun! Super Mario Maker takes all of the things (well, almost all) we know and love from Mario over the last 30 years and packages it all up into what is by far the biggest and potentially never-ending Mario game ever made. 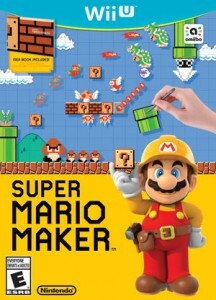 Super Mario Maker allows players to create their very own Mario levels using graphic styles, doodads, enemies, bosses, and gameplay mechanics from all of the 2D side-scrolling Mario games. In addition to making and playing your own levels, players can go to the Course World and download levels made by other players all over the world. The creation tools are phenomenal. I can’t imagine them working much better than this in terms of functionality. The experience is so seamless and smooth that you can literally place something, click play, and test it out on the spot. There aren’t load times or transitions — it’s instantaneous. The developers wanted this experience to be smooth, and they nailed it. Here’s where the gamepad shines and no other consoles can compete. Being able to use the stylus to drag/drop and manipulate two screens is a must. The list is actually extensive and growing, which leads me to believe we’re either going to see DLC, or if Nintendo treats this like they did Splatoon we may see this added for free. Fingers crossed. 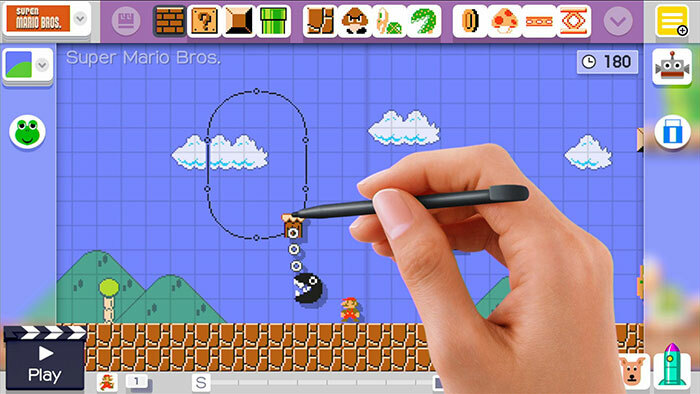 Super Mario Maker plays … well, it plays exactly like a Wii U Mario game. Combining all of the elements from various games creates a rather unique experience. Normally you don’t have the elements of a water level mixed with an airship levels. Squids with wings? The level of customization does indeed make you have to stay on your toes and never expect the level to stay true to the theme. Additional forms of play include the 100 Mario Mode (or 10 Mario Mode, etc depending on difficulty) where you are given a set of lives (100, 10, etc) to survive a certain number of courses. These modes present random course offerings (easy mode being Nintendo made) for you to complete. The more you complete, on harder difficulty, the more rewards you’ll get. Rewards include special costumes and goodies to use in maker mode. I like this mode because it gives me a reason to go out and play randomized player-made courses. Nintendo created a great interface for players to upload, download, play, share, comment, rate, etc., each other’s courses. This system integrates nicely the Miiverse, Nintendo’s internal social media’ish platform. Play a course and like it? Give it a star and comment so that others know it’s worth playing. Take screenshots are certain parts and include comments for others to see as they play a course. I have a few issues so far with this whole ‘people make courses and share it’ stuff. First, there’s a fad out there for “do nothing” courses. 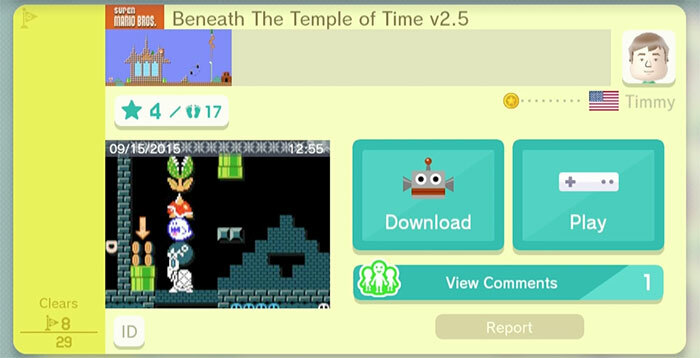 People get creative and come up with fun ways to basically run you through a level automatically. See my video above for an example. These are neat at first but when the top levels are all these automated play ones it’s sorta annoying. I want to play Mario, not watch Mario. I end up sorting through to find the ones that are fun. These issues are my own, and easily overlooked. I wouldn’t go anywhere near what other people are saying, which is that these levels or “crappy levels” are ruining the game. Don’t like them? Don’t play them. Star the ones you like! Find a maker you enjoy and follow them so that you can continue to play great levels they make. Super Mario Maker is a great addition to the Wii U, and to the Mario franchise. With a little love from Nintendo in the form of updates/additions it would be perfect. I can’t wait to see how Nintendo takes this to the next level, allowing us to (fingers crossed) create the 3D platformer games like Mario Galaxy/Mario 64/Mario Sunshine… Super Mario Maker 2 anyone? Super Mario Maker is without a doubt a winner. If you own a Wii U, and you don’t own SMM, then you’re doing it wrong. So I picked up Mario Maker on Saturday after watching a decent amount on Twitch, reading Keen’s review and watching Keen’s Let’s Play. While I have enjoyed the game, I honestly can give it no better than 7/10 do to the lack of a Mario “world” gameplay, and let me explain. The gameplay in and of itself is great, but the packaging leaves much to be desired. Mario Maker is nothing but piece-meal Mario levels, plain and simple. There is no continuity within the game. This is a glaring defect, one which will significantly hinder the long-term enjoyment of the game for me, if not fixed. It is impossible to link levels together to create a “world”. Because of this, coins, 1-ups, ending with Mario upgrades, checking each ?-box and other fun-to-do events in every Mario game are significantly washed down. I want to play a Mario game! One where you start with 3 lives, and progress through a series of levels to an end point. This is currently impossible in MM. The best option is Mario 100, where you start with 100 lives and try to beat a series of random levels from creators. I don’t mind this format, but after several play throughs, it has me wanting that “world” feel. While the individual level storage is saved in 30 different “worlds” of 4 levels each, in reality this acts as only 120 storage slots with no real advantage to having any levels within the same “world”. Why not be able to create “worlds” that link those 4 levels together. So I can start at the first with 3 lives and play through to the last? Maybe I am harping on this too much, but it’s a killer for me. I would love to play people’s actually created “worlds”. Where a theme exists throughout, where getting 1-ups excites me again, etc. I get the feeling this feature may have been purposely left out, and to me its a shame. I’m surprised this is not something Keen picked up on, but it’s a near fatal wound for me. I have a blog post going up tomorrow about my advanced thoughts on Mario Maker. I touch on… well, I touch on pretty much everything you do. For what it is — for what they are delivered — this is fantastic. For what it could be? For what we want it to be? It’s the first step. A great step, but the first step.